Virtual reality games often cause simulator sickness – inducing vertigo and sometimes nausea - but new research findings point to a potential strategy to ease the affliction. Various physiological systems govern the onset of simulator sickness: a person's overall sense of touch and position, or the somatosensory system; liquid-filled tubes in the ear called the vestibular system; and the oculumotor system, or muscles that control eye movements. "Simulator sickness is very common," said David Whittinghill, an assistant professor in Purdue University's Department of Computer Graphics Technology. "The problem is your perceptual system does not like it when the motion of your body and your visual system are out of synch. So if you see motion in your field of view you expect to be moving, and if you have motion in your eyes without motion in your vestibular system you get sick." Anecdotal evidence has suggested simulator sickness is less intense when games contain fixed visual reference objects - such as a racecar's dashboard or an airplane's cockpit - located within the user's field of view. "But you can't have a cockpit in every VR simulation," Whittinghill said. His research team was studying the problem when undergraduate student Bradley Ziegler suggested inserting the image of a virtual human nose in the center of the video display. "It was a stroke of genius," said Whittinghill, who teaches video game design. "You are constantly seeing your own nose. You tune it out, but it's still there, perhaps giving you a frame of reference to help ground you." The researchers have discovered that the virtual nose, or "nasum virtualis," reduces simulator sickness when inserted into popular games. Findings were presented earlier this month during the Game Developers Conference in San Francisco. Also working on the research are undergraduates James Moore and Tristan Case. Forty-one test subjects operated a number of virtual reality applications of varying motion intensity while wearing a virtual reality headset. In one of the applications, the user navigates the interior of a Tuscany villa. In another, it's the white-knuckle thrill ride of a roller coaster. Some of the subjects played games containing the virtual nose, while others played standard versions. They were not told that the nose was there. "Surprisingly, subjects did not notice the nasum virtualis while they were playing the games, and they were incredulous when its presence was revealed to them later in debriefings," Whittinghill said. 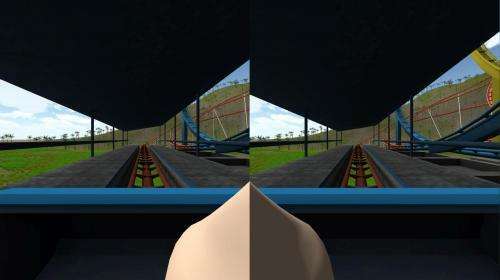 Findings showed the virtual nose allowed people using the Tuscany villa simulation to play an average of 94.2 seconds longer without feeling sick, while those playing the roller coaster game played an average of 2.2 seconds longer. "The roller coaster demo is short, but it's very intense at times, spinning upside down, jumping across chasms, plunging fully vertical, so people can't do it very long under the best of circumstances," Whittinghill said. "We had a reliable increase of 2 seconds, and it was a very clear trend. For the Tuscany demo it takes more time, but eventually you start getting queasy, and 94 seconds is a huge improvement." Researchers also used electro dermal activity (EDA) sensors to record electrical conduction across the skin, which is affected by sweating due to excitement, a proxy indication of simulator sickness. The measurements indicated EDA differences between subjects playing games with the nose and without. It isn't clear why the virtual nose evidently reduces simulator sickness. "Our suspicion is that you have this stable object that your body is accustomed to tuning out, but it's still there and your sensory system knows it," he said. "Our long-term goal is to create a fully predictive model of simulator sickness that will allow us to predict, given a specific set of perceptual and individual inputs, what level of simulator sickness one can expect," Whittinghill said. More information: Nasum Virtualis: A Simple Technique for Reducing Simulator Sickness, Game Developers Conference in San Francisco, 2015. The idea that video game research is the US economy makes me nauseous.